As a social media manager, that’s your cue. It’s your chance to demonstrate the value of your work, the impact of the decisions you’ve made. It’s your opportunity to be a pro, to go beyond the surface-level, “vanity” metrics—the likes and shares and retweets—and focusing on the data that matters, the numbers that prove your effort has had a positive, bottom-line impact on the business. The right data will assure executives that their investment in social is paying off. It’ll also help you continue to make smarter, more data-driven decisions moving forward. This article identifies the social media metrics that really matter, why they’re important, and how to track them. Bonus: Get the step-by-step social media strategy guide with pro tips on how to set goals and metrics to prove (and improve) ROI. Before diving into the metrics, let’s review where each one lives in the social funnel. Awareness: these metrics illuminate your current and potential audience. Engagement: these metrics show how audiences are interacting with your content. Conversion: these metrics demonstrate the effectiveness of your social engagement. Consumer: these metrics reflect how active customers think and feel about your brand. Every stage is populated with its own set of must-measure metrics, KPIs that shed light on the effectiveness of your social media marketing. These numbers illuminate your current and potential audience. Brand Awareness is the attention your brand gets, across all social media, during a reporting period, or a specific span of time that yields statistically relevant data. Attention can be expressed through a variety of metrics, including @mentions, shares, links, and impressions. Reporting periods are also variable, usually lasting a week, a month, or a quarter. STEP 1: Determine the attention metric(s) your organization wants tied to brand awareness. STEP 2: Determine the reporting period your organization wants tied to brand awareness. STEP 3: Be consistent. Consistency ensures that you’re benchmarking trends with accurate, dependable data. Note: A brand monitoring tool makes it easier to track every time someone mentions you on social media, with or without an @mention. Audience Growth Rate measures the speed at which your brand’s following increases on social media. It’s how quickly you gain followers. As access to the internet continues to increase around the world, brands’ social media followings will also increase. TrackMaven calls this social media inflation, or the expectation of growth. STEP 1: Measure your net new followers (on each platform) over a reporting period. STEP 2: Divide your net new followers by your total audience (on each platform) and multiply by 100 to get your audience growth rate percentage. Note: You can track your competitors’ progress the same way. Post Reach denotes how many people have seen a post since it went live. This metric is easy to find and even easier to understand. Most importantly, it’s actionable, since it’s affected by the timing (i.e., when is your audience online?) and the content (i.e., what does your audience find valuable?) of your post. STEP 1: Measure the reach of any given post. STEP 2: Divide the reach by your total number of followers and multiply by 100 to get your post reach percentage. 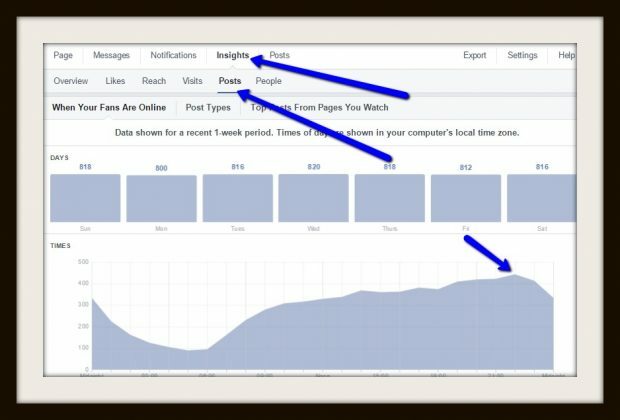 Note: On Facebook, the “When Your Fans Are Online” feature will tell you the optimal time to post. Use this data to increase your reach. Potential Reach measures the number of people who could, realistically, see a post during a reporting period. In other words, if one of your followers shared your post with her network, approximately two to five percent of her followers would factor into the post’s potential reach. Understanding this metric is important because, as a social marketer, you should always be working to expand your audience. Knowing your potential reach enables you to gauge your progress. STEP 1: Use a brand monitoring tool to track your total number of brand mentions. STEP 2: Record how many followers saw each mention (i.e., the audience of the account that mentioned you). STEP 3: Multiply those two numbers together to get your Theoretical Reach, or the absolute maximum number of people who could, in theory, see your brand mentions. Your potential reach is 2 to 5 percent of your theoretical reach. Social Share of Voice measures how many people are mentioning your brand on social media compared to your competitors. SSoV is, essentially, competitive analysis: how visible—and, therefore, relevant—is your brand in the market? STEP 1: Measure every mention your brand receives—direct and indirect—across your social networks. STEP 2: Measure your competitors’ mentions during the same reporting period. STEP 3: Add your mentions and those of your competitors to get the total industry mentions. STEP 4: Divide your brand mentions by the grand total and multiply by 100 to get your SSoV percentage. Note: Using social media analytics tools will make this process easier. These numbers show how people are interacting with your content. Applause Rate is the number of approval actions (e.g., likes, favorites) a post receives relative to your total number of followers. When a follower likes or favorites one of your posts, she’s acknowledging that it’s valuable to her. Knowing what percentage of your audience finds value in the things you post can—and should—inform your content moving forward. STEP 1: Add up the total approval actions a post received over the course of a reporting period. STEP 2: Divide that number by your total followers and multiply by 100 to get your applause rate percentage. Note: Use a social media impact tool to help track approval actions and simplify the process. Average Engagement Rate is the number of engagement actions (e.g., likes, shares, comments) a post receives relative to your total number of followers. It’s an important metric because higher engagement means your content is resonating with the audience. To prove that, track the engagement rate of every post. If you have a high engagement rate, the actual number of likes and shares and comments is irrelevant. STEP 1: Add up a post’s total likes, comments, and shares. STEP 2: Divide by your total number of followers and multiply by 100 to get your average engagement rate percentage. Note: The benchmark for this metric is different on every platform. Facebook and Twitter, for example, typically have lower engagement rates (e.g., 0.5 to one percent). Instagram, on the other hand, is known for its relatively high engagement rates (e.g., three to six percent). Amplification Rate is the ratio of shares per post to the number of overall followers. Basically, the higher your amplification rate, the more willing your followers are to associate themselves with your brand. STEP 1: Add up the number of times a post was shared (e.g., retweeted, repinned, regrammed) during a reporting period. STEP 2: Divide that number by your total number of followers and multiply by 100 to get your amplification rate percentage. Virality Rate is the number of people who shared your post relative to the number of unique views (i.e., impressions) it had during a reporting period. Like the other metrics on this list, virality rate goes beneath the surface. It’s about more than just likes. STEP 1: Measure a post’s impressions. STEP 2: Measure a post’s shares. STEP 3: Divide the number of shares by the number of impressions and multiply by 100 to get your virality rate percentage. These numbers demonstrate the effectiveness of your social engagement. Conversion Rate is the number of visitors who, after clicking on a link in your post, take action on a page (e.g., subscribe to your newsletter; download a gated content asset; register for a webinar) against that page’s total visitors. A high conversion rate means your content is valuable and compelling to the target audience. From a social media standpoint, it’s a sign that your post was relevant to the offer. In other words, it kept its promise. STEP 1: Create a post with a call-to-action link. Use a URL shortener to make it trackable. STEP 2: Place a “cookie” on the user’s machine. Doing so attaches the lead to a campaign. STEP 3: Use the campaign reporting to track the total number of clicks and conversions generated by the post. STEP 4: Divide conversions by total clicks and multiply by 100 to get your conversion rate percentage. Note: A post’s conversion rate can be high even if its traffic is low. The two metrics are mutually exclusive. Click-Through Rate, or CTR, is how often people click on the call-to-action link in your post. Not to be confused with other engagement actions (e.g., shares, likes, comments), your CTR is specifically tied to a link that brings the audience to additional content. Tracking CTR, often and accurately, will give you invaluable insight into how compelling your offer is to the target audience. STEP 1: Measure the total clicks on a post’s link. STEP 2: Measure the total impressions on that post. STEP 3: Divide the number of clicks by the number of impressions and multiply by 100 to get your CTR percentage. Note: Don’t forget to measure clicks and impressions within the same reporting period. Bounce Rate, is the percentage of page visitors who click on a link in your post, only to quickly leave the page they land on without taking an action. Bounce rate lets you measure your social media traffic—and, in turn, ROI—against other sources of traffic (e.g., traffic from a Facebook post vs. traffic from an organic Google search). If your social media bounce rate is lower than that of other sources, it’s proof that your social media campaigns are targeting the right audience — and, in turn, driving high-value traffic. STEP 1: Set up Google Analytics. 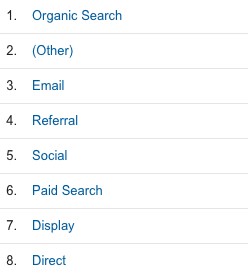 STEP 2: Open the “Acquisition” tab, and look under “All Traffic” for the “Channels” segment. STEP 3: Click on the “Bounce Rate” button, which will rank all of the channels from lowest bounce rate to highest. Note: Demonstrating the relative effectiveness of your social media efforts will go a long way in proving its value to the business. Cost-Per-Click, or CPC, is the amount you pay per individual click on your sponsored social media post. Whether you choose to advertise on Facebook, Instagram, Twitter, or Linkedin, don’t focus on your total spend. Instead, look to your CPC. It’ll help you weigh if your investment in attention is efficient, or wasteful. STEP 1: Check your platform’s Ad Manager. STEP 2: Check it often. Note: Never let your CPC campaigns go unattended for an extended period of time. Cost Per Thousands Impressions, or CPM, is the amount you pay every time a thousand people scroll past your sponsored social media post. Unlike in a CPC campaign, a CPM post won’t necessarily drive action. It’ll only create impressions, views. Therefore, CPM is a faster and less expensive way to split test content. Note: Never let your CPM campaigns go unattended for an extended period of time. Social Media Conversion Rate is the total number of conversions that came from social media, expressed as a percentage. Understanding this metric will give you clear insight into the effectiveness of each post in a campaign. In other words, it answers this question: how well does this offer resonate with our target audience? STEP 1: Create a link in the post using a shortened URL that places a “cookie” on the user’s machine. STEP 2: Measure your total number of conversions. STEP 3: Divide the social media conversions by the total number of conversions and multiply by 100 to get your social media conversion rate percentage. Conversation Rate is the ratio of comments per post to the number of overall followers you have. It’s another metric coined by Avinash Kaushik—and it’s better than tracking comments without any context. After all, getting an average of 20 comments per post is a lot more impressive if you only have 200 followers. STEP 1: Use Hootsuite Analytics to pull the number of comments you received during a reporting period. STEP 2: Divide that number by your total number of followers and multiply by 100 to get you conversation rate percentage. These numbers reflect how your active customers think and feel about your brand. Customer Testimonials are any customer review, assessment, comment, endorsement, or interview relating to a brand. Ultimately, great testimonials are the product of customer delight. If your brand makes people happy, they’ll be more likely to share their good experience with others. The benefits are clear: a consistent stream of sincere testimonials on social media will garner trust and credibility while boosting your brand’s presence. Ask your best customers to leave a review. Never offer to compensate them for their effort, of course, as that would undermine your credibility. Run a social media campaign that encourages people to create written, video, or online testimonials about your product, service, or mission. Link to your Google My Business review form to make leaving testimonials a simple, seamless process for your brand evangelists. Customer Satisfaction, or CSAT, is a metric that measures how happy people are with your product or service. Usually, the CSAT score is the product of one, straightforward question: How would you describe your overall satisfaction with this product? Customers are then asked to rate their satisfaction on a linear scale, either numerically (e.g., one to 10) or sentimentally (e.g., Poor; Fair; Good; Great; Excellent). CSAT has become a nearly ubiquitous way to understand how customers feel about your brand, mainly because it’s clear, concise, and easy to administer, especially on social media. STEP 1: Create a CSAT survey on social media. STEP 2: Add up the sum of all the scores. STEP 3: Divide the sum by the number of respondents and multiply by 10 to get your CSAT score. Net Promoter Score, or NPS, is a metric that measures customer loyalty. Unlike CSAT, NPS is good at predicting future customer engagement because it is the product of one—and only one—specifically phrased question: How likely is it that you would recommend our [company/product/service] to a friend? NPS is unique in that it measures customer satisfaction as well as future sales, which has made it a valuable, go-to metric for organizations of all sizes. STEP 1: Create a NPS survey on social media. STEP 2: Subtract the number of promoters from the number of detractors. STEP 3: Divide that number by the total number of respondents and multiply by 100 to get your NPS. Whether you meet with your boss once a month or once a day, your conversations will be more substantive—and impactful—if you highlight metrics that demonstrate the bottom-line impact of your effort. So dig deeper, and go beyond the readily accessible vanity metrics that literally anyone can report. Showcase your skills by presenting social media analytics that tell a story, a narrative that’s inherently valuable to your organization. You’ll work more, but you’ll also come away with more than your effort was worth.